Neutral tea cosies fit a very modern decorating style. Neutral tea cosies fit a very modern decorating style. These cozies are made to order and will be shipped typically within 1 week after your order is received. See the "Quick Ship!" group for tea cosies available to ship now. Scroll down to see all patterns in this group! Hummingbirds are artfully captured on this Tea Quilt tea cozy cover. The fabric is a variegated, naturally dyed batik quilters cotton with rich golds, tans and apricot on a black backdrop. 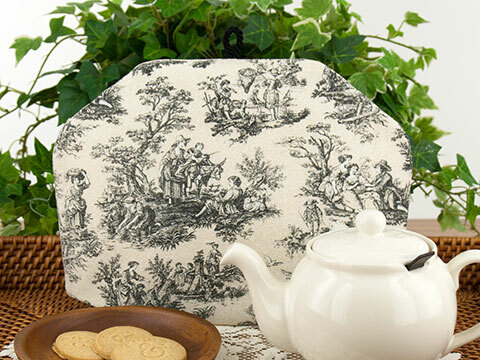 This tea cozy has a lovely mottled linen and muslin colored background with the traditional toile pastoral scenes in variegated charcoal to black print. The fabric is lightweight decorator cotton. 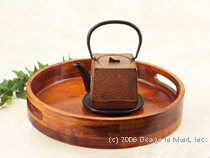 On this tea cozy, oak and a variety of other leaves are scattered across a variegated grey background, reminding us of trees seen through a rain-streaked window. Quilter's cotton. Shown with Chatsford teapot in cream. Microsuede fabric with the look of a tooled or embossed paisley and floral pattern makes this taupe-brown tea cozy stand out. Shown with Chatsford teapot in cream and Mara lilies mug. 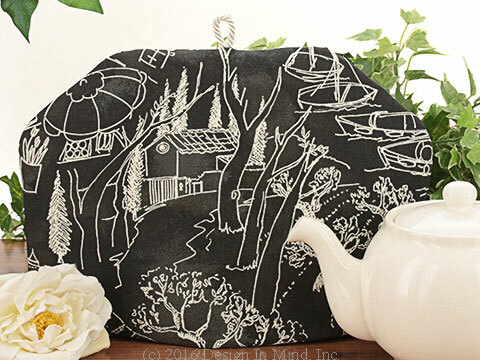 The mottled slate grey background of this charming tea cozy is sketched with varied scenes of mountains, vineyards, sidewalk cafes and boats in harbor. perhaps it reminds you of a favorite travel destination? Heavyweight cotton blend. Pattern will vary. Shown with our Chatsford teapot in cream. 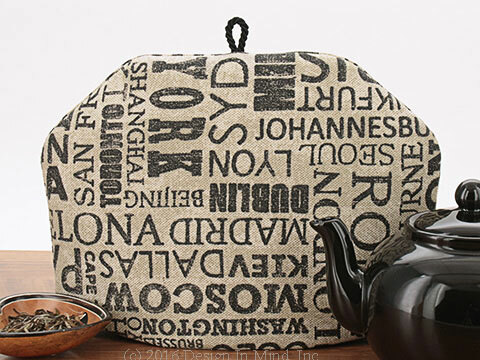 This tea cozy features city names from around the globe, printed in soft black on a variegated taupe background. Light upholstery weight cotton blend fabric with the texture of linen or burlap. 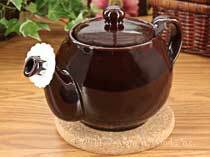 Shown with our Brown Betty teapot in black. 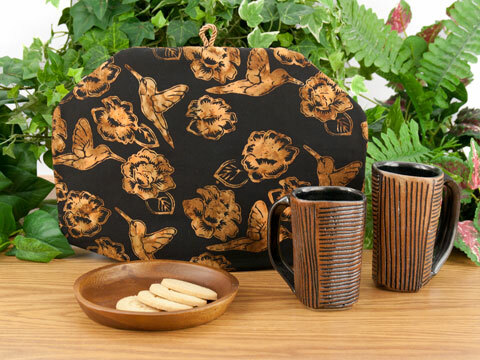 This tea cozy is crafted from a cotton batik fabric with rich copper, brown and warm cream colored meadow flowers on a black background. Shown with Bonjour Maximus press in copper. 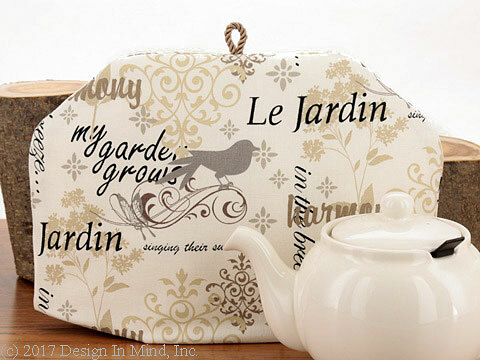 Sketched hydrangeas, mums, daisies, dragonflies and script handwriting on crackled white and soft grey background make this a striking black and white tea cozy. 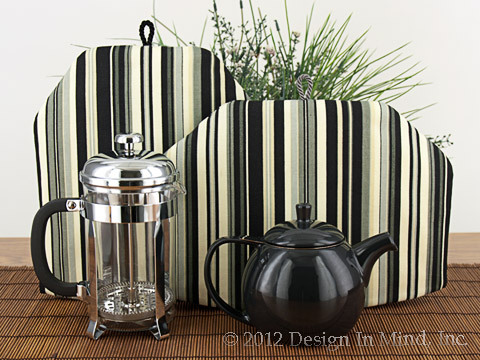 Shown with our stoneware teapot and mug in black. 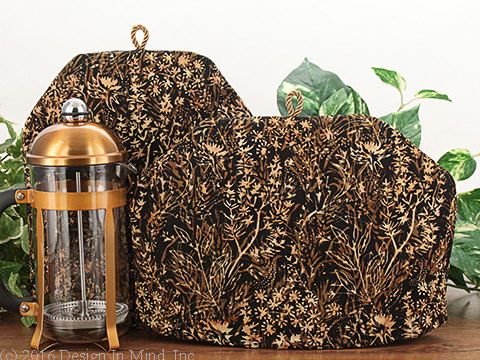 Quietly cheerful flowers in brown, grey, cream and green are outlined in metallic gold on a subtle patterned background of charcoal and black for this tea cozy. Quilter's cotton. 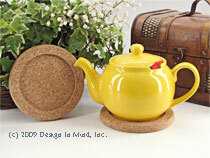 Shown with cast iron tea set in gold wicker. 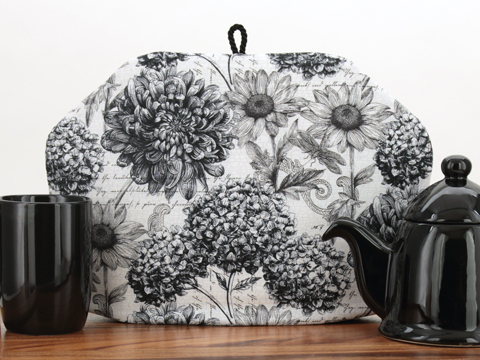 A variety of large woodcut flowers in soft black and white cover the white background of this eye-catching neutral tea cozy. Quilters cotton. Shown with Curve teapot in black. 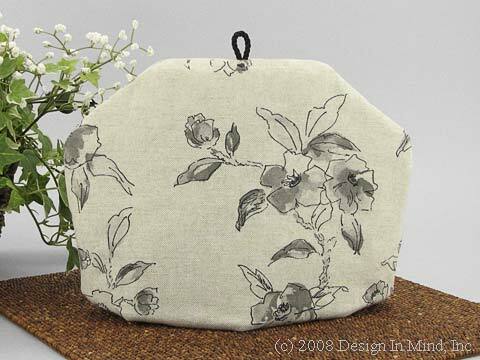 This tea cozy features a geometric and floral blend in neutral shades of gray, brown, black and white. Quilters cotton. 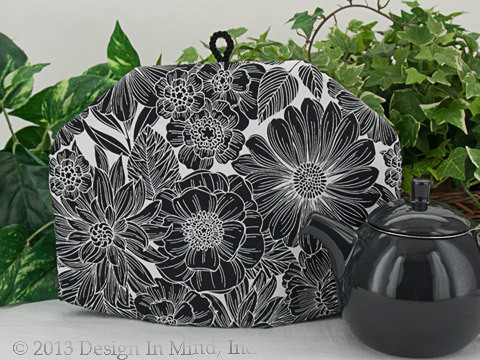 Shown with Curve teapot in black. 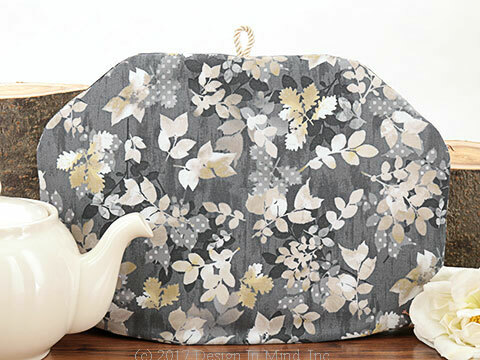 A variety of large cream-colored leaves on a black background cover this tea cozy of heavyweight cotton fabric. The Front Porch Tea Quilt tea cozy evokes memories of a Victorian porch swing. The fabric is a heavyweight cotton blend in black, grey, cream and sandy taupe. Cord color and stripe position will vary. 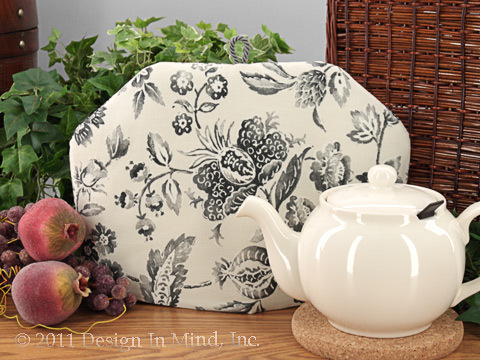 This tea cozy is a woven cream fabric with a lovely tonal stenciled mixed floral pattern in charcoal. Very nice. 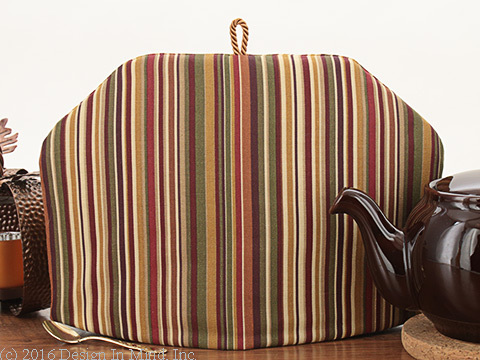 This tea cozy is covered in a lovely soft woven jacquard fabric. Flowers each have their own unique color when woven together in black, brown, tan, and copper all on a caramel background. Would look fabulous in a stainless steel kitchen. Very rich!! 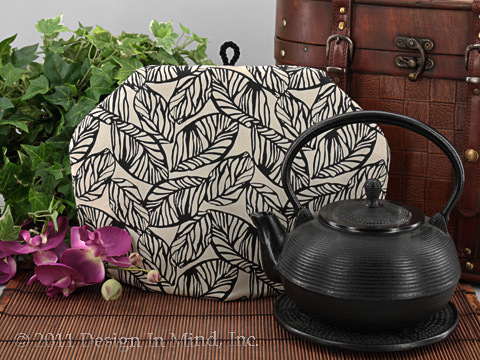 This tea cozy is made of a woven linen taupe fabric with large black palm leaves in outline. A nice compliment to any neutral decor. A heavy linen/cotton decorator fabric embellished with a beautiful rose vine design like a lovely charcoal sketch. Very rich! 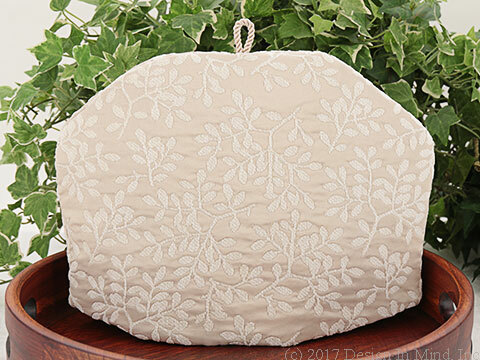 This tea cozy is quite elegant with a woven-in leaf design that is soft and fuzzy - contrasted against the champagne silky blend background. 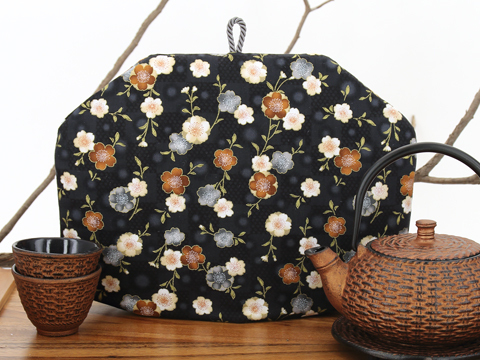 This black and snow white tea cozy is upbeat and full of flower petals. The fabric is a smooth poly-blend. An elegant tea cozy worthy of your best dinnerware! A tone-on-tone swirled vine is woven into the taupe silky background of this jacquard decorator fabric. Mink, taupe and gold tapestry rectangles in a luxurious weave. Tea cozy in upholstery weight fabric with a mix of weaves and textures. Oatmeal, hazelnut brown, pale chambray and pewter grey. Scrolls, medallions, birds and garden themed phrases in shades of taupe, pale gold, grey and black on soft cream background. Shown with Chatsford teapot in cream. Decorator weight cotton blend fabric. A new tea cozy in our porch series, Autumn Porch is made from a heavyweight cotton blend fabric in warm autumnal shades of copper, cream, eggplant, olive, cranberry, taupe and gold. Shown with our Chatsford teapot in rockingham brown. How do I use a tea cozy? How do I check my order online?